Here's preview no. 2 for the automatic crowd character generator. Some face rigging experiments, and the body rig works! The rig is automatically generated from the mesh. 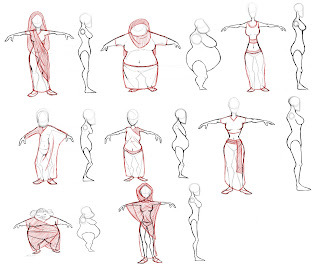 All the body meshes shown have identical topologies. Clothing and hair coming soon! 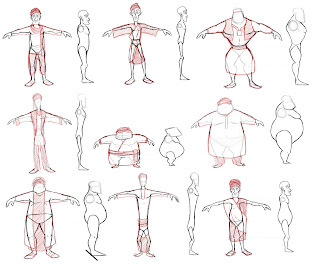 Here are the original body designs for the crowd characters by Cassidy Stone. Here is the part of the path environment we are calling the "Steve Encounter". This is where the boy zooms past Steve and almost makes him drop his pottery! Drake Logan is modeling this section. Andrew Lopez did the initial layout. The Boy character is completely textured now! By Stephanie Miranda. Here are the props for the King's balcony. They were all designed and modeled by Nicky Weston. The brick walls and lanterns that will be placed along the mountain path. Modeled and normal mapped by Stephen Milota.